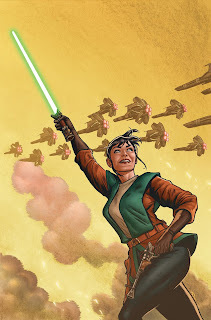 It's the next installment of Star Wars: Knight Errant! The series, which premiered last fall, showcases a new era in the Star Wars universe set 1,000 years before the events of Episode I: The Phantom Menace. It'll be hitting stands this August, and I'll be returning as cover artist for its run. I'm psyched. I really like the "WW2, Over There Boys!" feel of this cover. Great work! Oooh, love the textures on this one! Awesome! You really need to do interior art so I can actually buy some of these comics. Very nice! What a cool gig that is! Jeff - Thanks, I was definitely going for an American WWII propaganda poster-type feel here. Glad it comes through. Christina - Thanks! I did some toying around with pastel for the background here. Munchanka - Interior stories on the way!